15 Bars: You can purchase any flavour of bars from this page, or you can BUILD A BOX combining different bar flavours by clicking HERE. Four of the TORQ bars are certified Fairtrade and one is certified Organic by the Soil Association and utilises fairly-traded fruit. The four Fairtrade bars also contain a dose of D-Ribose and a blend of potent Vitamins and Minerals included in the ingredient matrix as a pre-emptive measure to optimise post exercise recovery. TORQ Bar forms part of the TORQ Fuelling System, so can be used alongside TORQ’s energy drinks, gels and chews to fuel optimal performances. 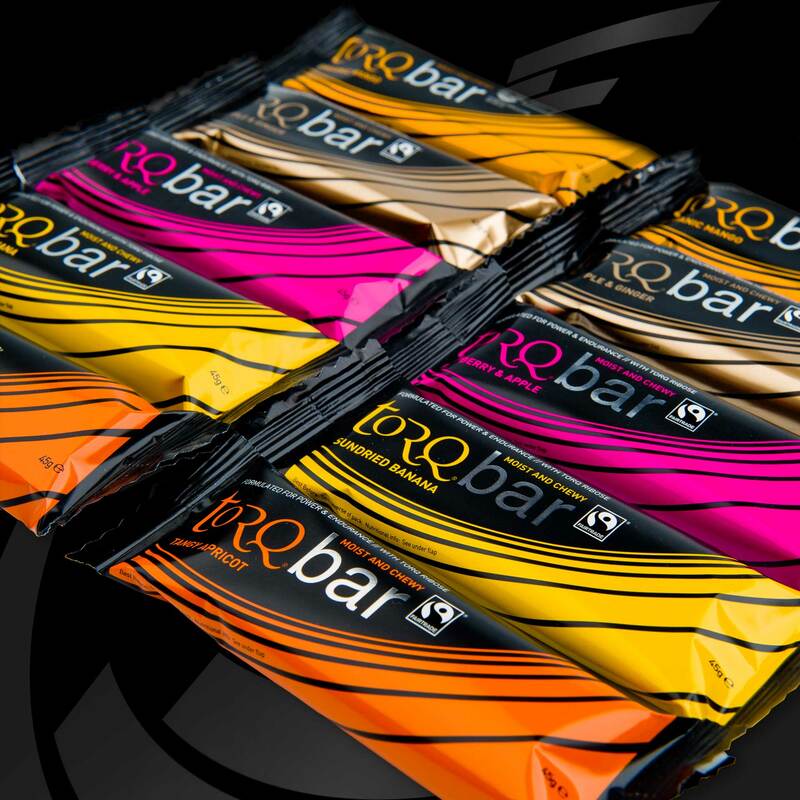 Each TORQ Bar provides 30 grams of multiple-transportable carbohydrates (1 TORQ Unit). The TORQ Fuelling System suggests consuming 2-3 TORQ Units per hour by taking on board our energy drink (TORQ Energy) along with the other more concentrated TORQ Units displayed in the table below, of which the TORQ Bar is one. The higher your perspiration rates, the more TORQ Energy you will need to consume relative to our concentrated fuelling units and when perspiration rates are lower, more concentrated TORQ Units should be consumed and less energy drink. The choice of which concentrated TORQ Units to consume is entirely yours. TORQ Gel, TORQ Bar and TORQ Chew are all optimised with multiple-transportable carbohydrates, so the only difference between them is the texture; Smooth, Soft or Chewy. Again, this interaction between TORQ’s fuelling products is explained fully HERE and we also discuss this in more detail later on this page. The TORQ Fuelling System area of this website clearly explains how TORQ Bar works alongside TORQ’s other fuelling products (TORQ Energy, TORQ Gel and TORQ Chew). We believe TORQ Bar to be the softest, most easy-to-eat energy bar on the market, making it extremely easy to consume whilst exercising. 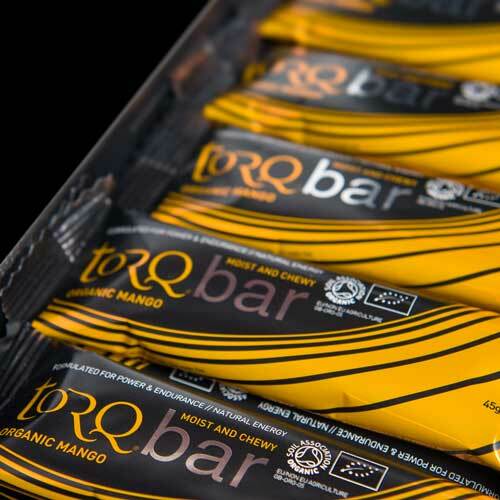 Having said this, there is no quicker way to consume 30 grams of carbohydrate (1 TORQ Unit) than via our TORQ Gel. We don’t recommend using TORQ Bar or TORQ Chew during high intensity racing or training, when heavy breathing makes consuming them difficult. For these reasons, we advise combining TORQ Energy Drink with TORQ Energy Gels during higher intensity racing and factor in TORQ Bars and TORQ Chews over the longer distances/lower intensities for variety. Of course, the beauty of the TORQ Fuelling System is that the choice is yours and we accept that everyone has different preferences. As the table above indicates, we describe the texture of the TORQ Bar as SOFT. 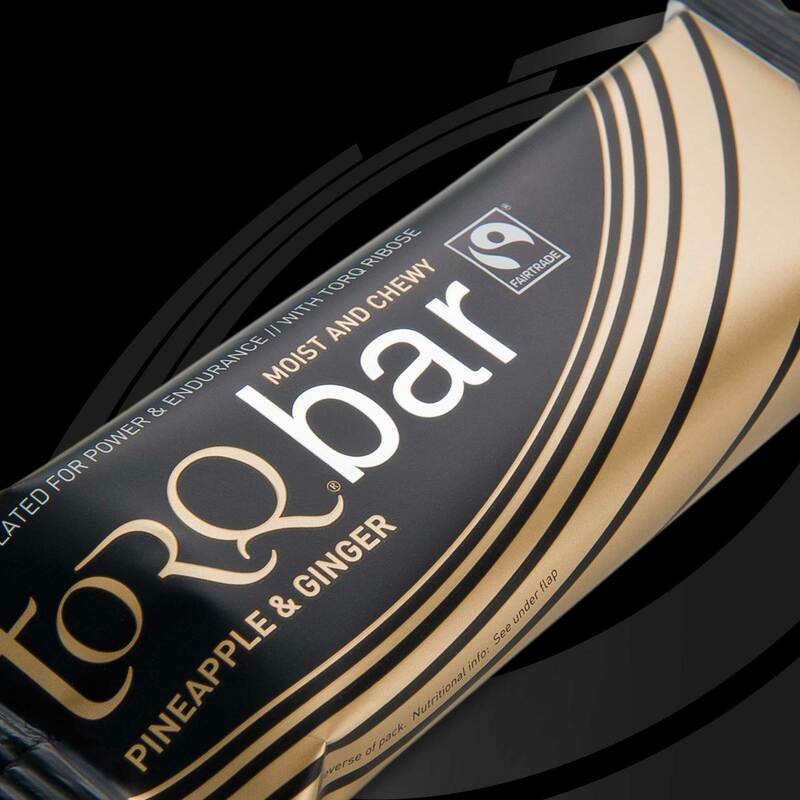 TORQ Bar utilises a blend of glucose-derivatives and fructose that are exceptionally close to the 2:1 ratio recommended by a now substantial body of peer-reviewed published research (see bottom of this page for details). The carbohydrate sources for TORQ Bar come from a special extremely low osmolality maize-derived maltodextrin (a long chain glucose derivative), oats, raisins, rice crisps and fructose syrup. 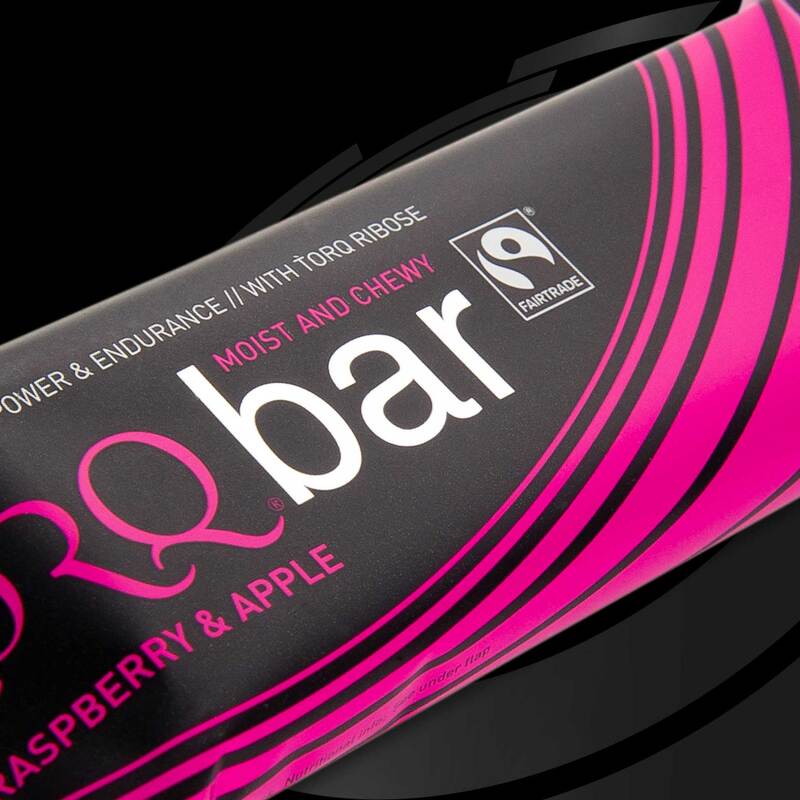 12 to 13% of the TORQ Bars’ ingredient matrix is derived from real fruit – the fruit that gives the bar its flavour profile. This dual-delivery carbohydrate formulation has been proven beyond doubt to supply energy faster than any other combination of carbohydrates or single carbohydrate source formulations. Take a look at the two very short movie clips below, which demonstrate how 2:1 Glucose-Derivatives:Fructose deliver over 40% more carbohydrate to the blood per hour than single glucose sources (the next best option). The concentrated nature of TORQ Bar pitches its tonicity firmly in the hypertonic zone, meaning that the product has been optimised to prioritise fuel delivery over fluid supply. This, in combination with the unique integration of multiple-transportable carbohydrates (as explained above) and their soft, moist and chewy texture makes TORQ Bar an extremely potent useable fuel source. The TORQ Fuelling System outlines how TORQ Bars should be used in combination with our other fuelling products, so please take the time to read this section of the website. 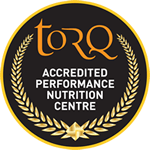 TORQ Bar will not satisfy your hydration requirements, so it is vital that you use this product in conjunction with TORQ Energy or TORQ Hypotonic drinks to ensure optimal physical performance. As the TORQ Fuelling System confirms, there may be high perspiration situations where the intake of TORQ Bar units should be limited in favour of TORQ Energy consumption to address the body’s fluid and electrolyte requirements. On the other hand, in low perspiration environments, TORQ Bar and our other concentrated TORQ Units (TORQ Gel and TORQ Chew) should represent a more significant proportion of your fuel intake. As long as 2-3 TORQ Units per hour are maintained in every scenario, fuelling will be optimal, you just need to drink more of your fuelling units if perspiration rates are high and less when lower. TORQ do produce a hypotonic product, which prioritises fluid delivery over fuel supply and not surprisingly it’s called TORQ Hypotonic. This product has ultimately been designed for situations where perspiration rates are exceptionally high and fuel delivery is less important (high perspiration rates during sessions lasting less than 1 hour), but it can be used as part of the TORQ Fuelling System for longer duration efforts, it just necessitates a higher consumption of TORQ Gel, Bar or Chew TORQ Units than would be necessary if using TORQ Energy as a hydration source. 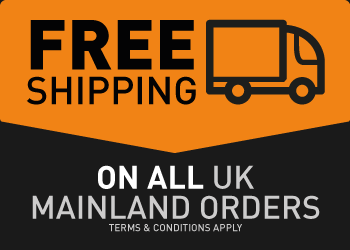 For further information on TORQ Hypotonic, click here. It’s a simple concept, but one of the main motivations for engineering the TORQ Bar back in 2003 was because every other energy bar on the market was impossible to eat and it made sense to us that the first rule of sports nutrition had to be “You’ve got to be able to eat it.” As however advanced the product is, if you can’t get the calories in to your body, it’s not going to work. 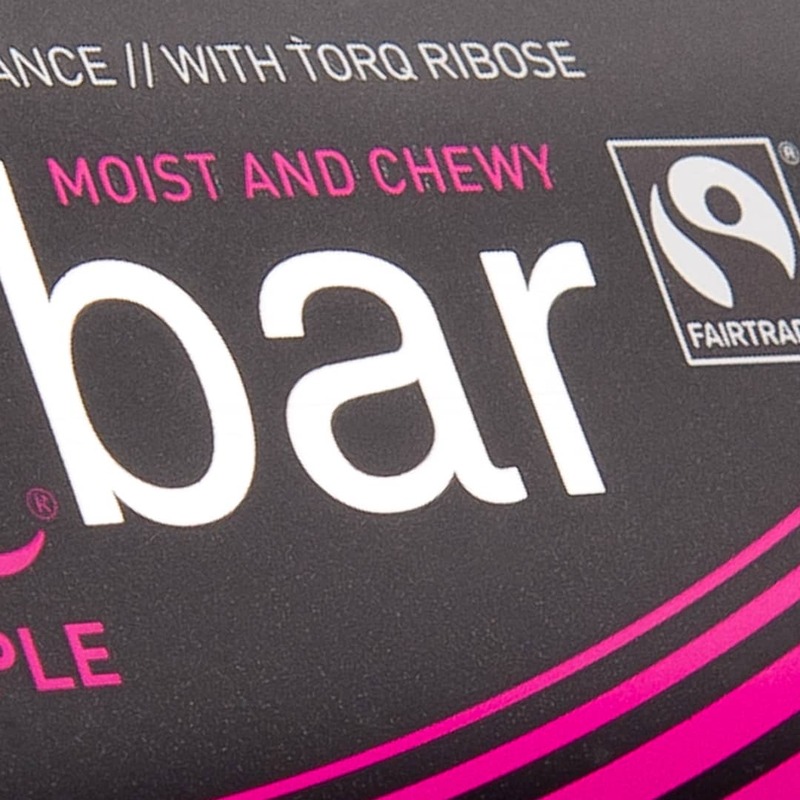 TORQ launched the TORQ Bar with its ‘Moist & Chewy’ tagline and the rest (as they say) is history. Our first ever energy product is as popular today as it always has been. 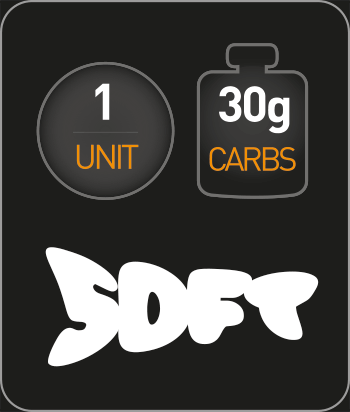 Another nutritional fundamental is that an energy product MUST be low fat for it to deliver the carbohydrate contained within it quickly and efficiently and although this is not a problem linked to energy drinks and gels on the market, manufacturers seem to struggle to keep the fat content low in their energy bars. This is principally because it’s exceptionally difficult to make a tasty low fat energy bar and also because seemingly nutrition brands’ principles and common sense literally fly out of the window when confronted with the dilemma that the public might be more interested in purchasing a chocolate/yoghurt coated energy bar, or a bar containing nuts even if it doesn’t work properly. 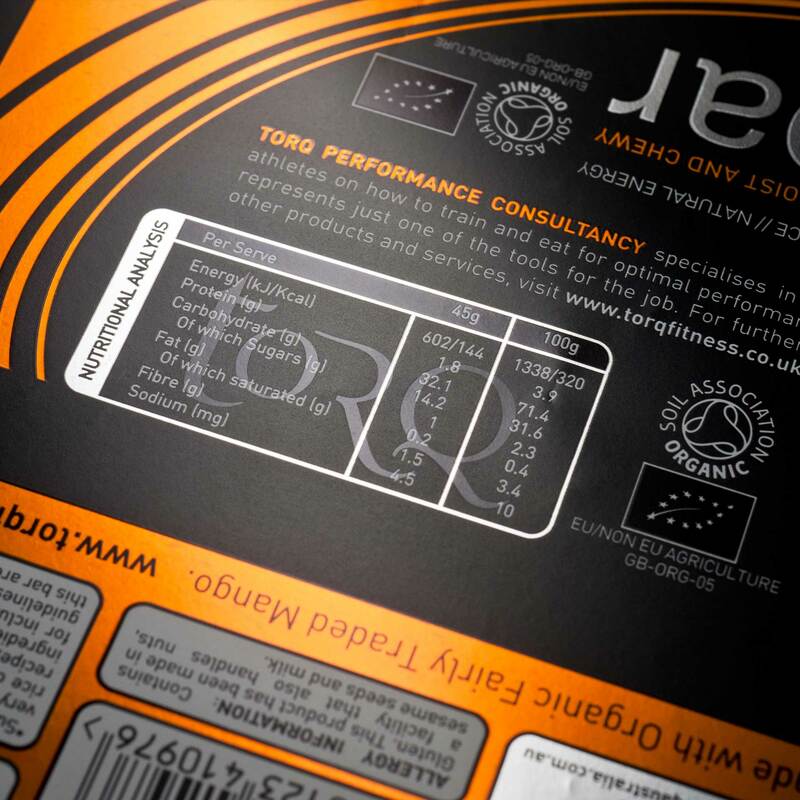 The TORQ Bar, being the first product we ever produced, pretty much sums up our attitude to Performance Nutrition and to you as our customers. 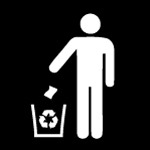 We’re here to make the best possible products using all the available research and we will absolutely not compromise. D-Ribose is a natural 5-carbon sugar, which is manufactured by the human body from glucose and is present in every living cell of the body. It is used to manufacture ATP, the energy currency of the cell, from scratch. After particularly heavy physical training, full recovery at a cellular level (which requires ribose), can take many days. Research has proven that supplementation with ribose can boost cellular recovery by a staggering 340-430% (see references at the bottom of this page). Ribose is a very important ingredient that we use in both our TORQ Bar and TORQ Recovery Drink and it plays a very unique role in the recovery process. For further information on this amazing nutrient, click HERE. 4 of our bars are certified Fairtrade, which means that the farmers in the developing countries, where the ingredients for our products are produced, are paid a fair price for their crop.  The Organic Mango TORQ Bar contains fairly-traded mango and is certified Organic by the Soil Association. These values and principles are extremely important to us at TORQ. Under exercise stress, digestion is affected as blood is diverted to the working muscles and any solutes added to a product will raise its osmolality unnecessarily, making it harder to digest. So, irrespective of the health debate surrounding the consumption of artificial ingredients, during exercise is certainly not the time to take them. 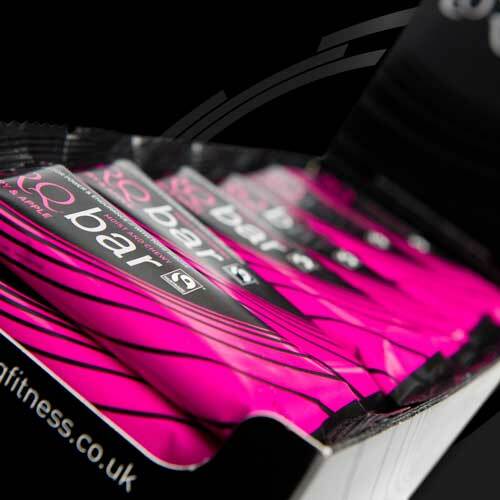 Therefore, no flavouring is added to TORQ Bar (we just utilise the natural flavours already present in the ingredients) and we don’t use colours (artificial or natural), because they simply don’t need to be in the product. For the same reasons as highlighted above, we don’t believe in the use of artificial sweeteners like Aspatame, Acsulfame-K, Saccharine and Sucralose. These artificial sweeteners are 100’s of times sweeter than sugar and Aspartame/Acsulfame-K are particularly controversial with regard to long-term health. They offer no performance benefit at all and so our stance here is the same as it is with colours and preservatives – if they don’t need to be included in our formulations for functional reasons, why include them? Ingredients: Raisins (29%), Oats (Gluten), Fructose Syrup, Maltodextrin, Rice Crisps (7%) (Rice Flour, Malter Barley Flour, Sugar, Sunflower Oil, Sunflower Lecithin), Candied Peel (4%) (Orange Peel, Lemon Peel, Glucose-Fructose Syrup, Rice Flour, Sugar, Citric Acid), Ribose (0.8%), Ground Mixed Spice (0.3%) (Coriander Seed, Cinnamon, Clove, Nutmeg, Cassia), Vitamin Mix (0.2%). Allergy Information: For allergens, see ingredients in bold. Contains Gluten. In making this product, we have taken steps to minimise cross-contamination with nuts, sesame seeds and milk. Ingredients: Oats (Gluten) (24%), Raisins (19%), Maltodextrin, Fructose Syrup, Apricot (Sulphur Dixoide) (13%), Rice Crisp (Rice Flour, Barley Flour (Gluten), Sugar, Sunflower Oil, Emulsifier, Sunflower Lecithin) (7%), Ribose (0.77%), Vitamin & Mineral Mix (0.4%). Allergy Information: For allergens, see ingredients in bold. Contains Gluten. Sulphites are used to preserve the tanginess of the Fairtrade Apricot. In making this product, we have taken steps to minimise cross-contamination with nuts, sesame seeds and milk. Ingredients: Oats (Gluten) (23%), Raisins (19%), Banana (12%), Maltodextrin, Fructose Syrup, Rice Crisp (Rice Flour, Barley Flour (Gluten), Sugar, Sunflower Oil, Emulsifier, Sunflower Lecithin) (7%), Ribose (0.77%), Vitamin & Mineral Mix (0.4%). Ingredients: Oats (Gluten) (23%), Raisins (20%), Maltodextrin, Fructose Syrup, Apple (11%), Rice Crisp (Rice Flour, Barley Flour (Gluten), Sugar, Sunflower Oil, Emulsifier, Sunflower Lecithin) (7%), Raspberry (2.3%), Ribose (0.77%), Vitamin & Mineral Mix (0.4%). Ingredients: Oats (Gluten) (24%), Raisins (19%), Maltodextrin, Fructose Syrup, Pineapple (12%), Rice Crisp (Rice Flour, Barley Flour (Gluten), Sugar, Sunflower Oil, Emulsifier, Sunflower Lecithin) (7%), Ribose (0.77%), Ginger (0.5%), Vitamin & Mineral Mix (0.4%). Ingredients: Organic Oats (Gluten) (23%), Organic Raisins (Organic Raisins, Organic Palm Oil) (19%), Organic Maltodextrin, Organic Fructose Syrup, Organic Mango (12%), Organic Rice Crisp (Organic Rice Flour, Organic Sugar, Organic Malt Extract, Organic Sunflower Oil, Sunflower Lecithin) (7%). Burke, E.R. PhD (1999). D-Ribose, what you need to know. Avery Publishing Group. Burke, E.R. PhD (2002). Serious Cycling. Human Kinetics. Pages 167-169 (D-Ribose).